Cassava is a root vegetable popular in indigenous parts of South America, Asia, and Africa, where it has been a staple for centuries. In fact, it is an indispensable carbohydrate for millions of people living in these parts of the world. But, have you heard of cassava? It is better known to Americans as tapioca—the mildly sweet pearls found in the popular pudding, and also an Asian cold concoction called bubble tea. Tapioca is also used as a thickener in stews and soups, added to burgers and dough, used in gluten-free or gluten-containing breads, and sometimes combined with other flours like almond meal or coconut flour to improve the nutrition content. Tapioca is the starchy liquid extracted from cassava root that is high in carbs but quite negligible of protein, fiber, or other important nutrients. Raw cassava, on the other hand, is not just high in carbs, but it is also an excellent source of fiber, protein, manganese, and vitamin C.
As a result, cassava powder and flour make a better gluten-free alternative for those with celiac disease or gluten sensitivities. It is also low on the glycemic index, and therefore a good choice for diabetics. And at the same time, it contains beneficial resistant starch that feds the good gut bacteria. 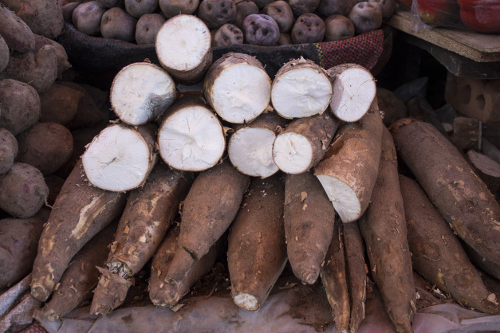 Read on to learn more about cassava, its health benefits, and how to use it. Cassava (Manihot esculenta Crantz) is a starchy, sweet, and nut-flavored root vegetable that is a valuable nutrition source for countless Asians, Africans, and Latin Americans. It is such as staple crop in the world because it requires low energy to produce, which results in high yields of the crop per plant. It is highly intolerant to stressful environments, and it can be grown regions where fresh food is often scarce. That is why it’s considered a sustainable crop for preventing famine. Cassava is a perennial plant typically grown in tropical climates, and the roots are often compared to large yams—they can weigh several pounds. Delicate care must be taken in harvest, since they only have a shelf life of a few days. The root has a brown, fibrous skin, along with a snowy white interior flesh. Since it becomes bruised quite easily, it is often sold in a protective wax coating. In the U.S., cassava is often called yuca, as well as yuuca root, casabe, manioc, Brazilian arrowroot, and mandioca. Nearly every part of the cassava plant can be used, including the leaves and stems. The leaves contain 100 times more protein than the root, but again, the leaves must be cooked with the water discarded. Livestock feed is even made from these leaves. The stems, on the other hand, are replanted to help increase the growth of mushrooms, while the stems are also made into firewood and various paper products. What makes cassava nutrition so impressive? A quarter cup of cassava flour contains 114 calories, 2 grams of fiber, 28 grams of carbohydrates, and about 17% of recommended daily vitamin C. However, a cup of raw cassava contains 330 calories, 78.4 grams of carbs, 3.7 grams of fiber, and 2.8 grams of protein. Cassava is also loaded with 71% of recommended daily vitamin C, and 40% of the required amount of manganese. It is also an excellent source of folate, vitamin B1, vitamin B2, vitamin B3, vitamin B6, magnesium, potassium, and copper. There are also trace amounts of vitamin B5, vitamin A, vitamin E, vitamin K, calcium, iron, selenium, zinc, and phosphorus. The following is a comprehensive cassava nutrition chart with information for a cup of raw cassava, or 206 grams of the vegetable. What are the health benefits of cassava? Individuals with food allergies often benefit from cassava root, since it is grain-free, gluten-free, and nut free. It also contains fewer calories than other gluten-free flours like coconut or almond flour. The vegetable is also high in resistant starch, which may promote digestion, decrease inflammation, and reduce the risk of type-2 diabetes and obesity. Let’s take a greater look at the health benefits of cassava root. Since cassava is naturally gluten-free, it is extremely appealing to those with celiac disease or others sensitive to gluten. The good part is that cassava flour can be used in recipes without being detected; therefore, it is indistinguishable from wheat-based products. Its texture lends well to baking cookies, brownies, and denser breads. The flour also goes well to form burger patties. It is also perfect for those unable to use coconut or nut-based flours in recipes. Since it is also grain-free, cassava is totally paleo-friendly, while it is a good food choice for people with digestive problems, including irritable bowel syndrome (IBS) or inflammatory bowel diseases (IBD) like Crohn’s disease or ulcerative colitis. Cassava is also a high-resistant starch, which bypasses digestion and travels through the small intestine to the colon, where intestinal bacteria turn it into beneficial short-chain fatty acids. Resistant starch feeds the good bacteria in the colon, and later is made into short chain fatty acids like inflammation-reducing butyrate that is helpful in allergies, IBS, IBD, and autoimmune diseases. Cassava is also a good choice for people with diabetes. Studies have found that resistant starch may reduce blood sugar levels after meals, improve insulin sensitivity, and help manage metabolic syndrome. Also, the plant benefits diabetics while promoting fullness, reducing their appetite and food intake, and therefore their overall weight. Although there are cassava health benefits, there are some precautions to consider with cassava root. First of all, it is important to mention that processing the root significantly reduces its nutritional value. Peeling, chopping, and cooking it will destroy its many beneficial vitamins and minerals, and most of its fiber and resistant starch as well. Still, it may be dangerous to consume in raw form, especially in large amounts and when improperly prepared. Boiling cassava root is one method that has been found to retain the most nutrients, except for its vitamin C that is sensitive to heat and leaches into the water. Although cassava is loaded with key nutrients, it also contains ingredients that aren’t so wholesome. Let’s take a brief look at the potential downfalls of what’s inside. Most foods contain anti-nutrients that may impact populations at risk of malnutrition. For instance, the saponins in cassava may reduce absorption of certain minerals and vitamins. Phytate is an anti-nutrient in the crop that may interfere with the absorption of calcium, magnesium, zinc, and iron. The tannins in cassava will also decrease the digestibility of protein, and interfere with the absorption of zinc, copper, iron, and vitamin B1. That being said, the effects of anti-nutrients have greater prominence when consumed frequently, and are part of a diet that is nutritionally inadequate. As a result, anti-nutrients likely aren’t a major problem when cassava is only consumed on occasion. Interestingly, in some circumstances, saponins and tannins can be beneficial. Raw cassava root can be poisonous because it contains chemicals called cyanogenic glycosides, which release cyanide in the body. When consumed often, cassava root is linked with cyanide poisoning, which may lead to impaired nerve and thyroid function, paralysis, organ damage, headaches, dizziness, stomach pain, nausea, vomiting, and even death. It is important to note that products made from the root like tapioca, cassava flour, and cassava powder contain no or very little cyanide-producing compounds, and therefore are safe for consumption. Peeling, soaking for 48 to 60 hours, cooking it, and pairing it with protein are all ways to reduce the effect of cyanide-producing compounds in cassava root. Cassava flour or powder can be used as a 1:1 substitute in countless recipes for other flours like all-purpose flour and wheat flour. Cassava should never be consumed raw, and around the world it used to replace potatoes or added to sweet desserts. It is also used to produce garri—a product similar to tapioca, also called cassava powder. You can also ground and cook the root vegetable to form a dry meal called farofa that is used as a condiment, eaten on its own, or toasted in butter. It is always advisable to look for cassava products labeled “100% Yuca (Cassava),” which have one ingredient and no preservative or fillers. As mentioned, the flour makes a good addition to cakes, cookies, brownies, gluten-free bread, pancakes, pizza crust, crepes, burgers, tempura batter, and sauces or gravy. The root can also be baked or roasted in a similar way as a potato. It can be mashed or mixed with soups, omelets, and stir-fries, and sometimes ground into flour and used in crackers and breads. In most cases, it works well in the same proportion as wheat flour; however, in yeast-based recipes cassava flour likely won’t work since it won’t naturally become fluffy like wheat. On low-medium heat, pour oil and onion in a saucepan, and sauté the onion for three minutes until you get a golden clear color. Then add bell peppers, tomatoes, and continue sautéing for another three minutes on low-medium heat. In a small bowl, place the vegetable cube and add a tablespoon of boiling water. Mix well with a fork until the cube has dissolved. Add mixture to sauce in saucepan, and mix well, and add salt and pepper to taste. Reduce the heat to low, and add spinach, cover and cook for another five minutes. For a sauce, in a large bowl pour in a half cup of cassava powder, and slowly stir and pour in the boiled water till all the water has been used. Continue stirring until the mixture is lump free and resembles mash potatoes. Empty mixture into a wide cooking pot. On medium heat, place the pot and continue stirring for three minutes. Empty the mixture in a wide serving bowl, and add half the vegetable sauce on the cassava powder mixture. Although tapioca flour and cassava flour are both made from the same plant, they are from different parts of the plant. Cassava flour and cassava powder are both made from the entire root, whereas tapioca is bleached and extracted starch from the root. The cassava flour is naturally grown, peeled, dried, and milled. Arrowroot is also similar to tapioca, and contains various root plants like cassava, and other plant varieties in Africa and Asia. Overall, cassava is an excellent gluten-free, grain-free, and nut-free option that is low in calories, and beneficial for diabetics and those with digestive problems. Cassava-based products like garri, tapioca, and cassava flour have been processed enough to remove any toxic exposure to cyanide-producing chemicals, and therefore safe to eat. When you do eat it, prepare it properly, and consume it in reasonable portions. “Cassava, raw Nutrition Facts & Calories,” SELFNutritionData; http://nutritiondata.self.com/facts/vegetables-and-vegetable-products/2389/2, last accessed June 15, 2017. Fletcher, D., “Cassava,” TIME, Feb. 22, 2010; http://content.time.com/time/specials/packages/article/0,28804,1967235_1967238_1967250,00.html, last accessed June 15, 2017. “Cassava nutrition facts,” Nutrition and You; http://www.nutrition-and-you.com/cassava.html, last accessed June 15, 2017. Rodriguez, H., “Cassava (Yuca),” the spruce, January 26, 2017; https://www.thespruce.com/introduction-to-cassava-yuca-2138084. Elliott, B., “Cassava: Benefits and Dangers,” Authority Nutrition, March 24, 2017; https://authoritynutrition.com/cassava/, last accessed June 15, 2017. Behall, K.M., et al., “Consumption of both resistant starch and beta-glucan improves postprandial plasma glucose and insulin in women,” Diabetes Care, May 2006; 29(5): 976-981. https://www.ncbi.nlm.nih.gov/pubmed/16644623, last accessed June 15, 2017. Robertson, M.D., et al., “Insulin-sensitizing effects of dietary resistant starch and effects on skeletal muscle and adipose tissue metabolism,” American Journal of Clinical Nutrition, September 2005; 82(3): 559-567. https://www.ncbi.nlm.nih.gov/pubmed/16155268, last accessed June 15, 2017. Raben, A., et al., “Resistant starch: the effect on postprandial glycemia, hormonal response, and satiety,” American Journal of Clinical Nutrition, October 1994; 60(4): 544-551. https://www.ncbi.nlm.nih.gov/pubmed/8092089, last accessed June 15, 2017. Bodinham, C.L., et al., “Acute ingestion of resistant starch reduces food intake in healthy adults,” British Journal of Nutrition, March 2010; 103(6): 917-922, doi: 10.1017/S0007114509992534, last accessed June 15, 2017.